Best Books for Men: Book Review - "Eat That Frog! 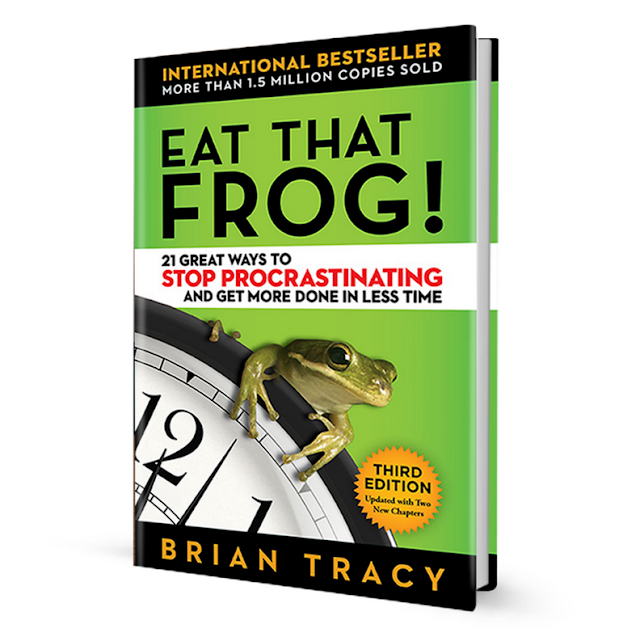 21 Great Ways to Stop Procrastinating and Get More Done in Less Time"
Book Review - "Eat That Frog! 21 Great Ways to Stop Procrastinating and Get More Done in Less Time"
Hands-down, Eat That Frog: 21 Great Ways to Stop Procrastinating and Get More Done in Less Time is the finest productivity book I have read. The unusual title refers to the saying from Mark Twain, that if you have two frogs to eat in the morning, you should eat the biggest, ugliest one first. Then, eating the second frog won’t be a big deal. Tracy applies this to productivity. If you start your day working on the biggest, toughest task and finish it completely, the rest of your day will be enjoyable. The average person procrastinates on the important tasks, and wastes time working on less-important tasks. There are 21 chapters, each identifying a technique that will help you become more productive. The chapters are bite-sized – many are just four pages. The “frog” principle isn’t one of the 21 techniques, but is a theme that runs through several of the techniques. I especially liked Chapter 3: “Apply the 80/20 Rule to Everything.” When it comes to your to-do list, this rule means 80% of the tasks on your list are low-value items that will not benefit your organization or make a difference in your career. Only 15% to 20% are the valuable tasks you should start and complete first. As for the 80% low-value tasks on your list, Tracy says you should delegate them or return to them only when your valuable tasks are done. Unfortunately, most people make themselves less effective by spending their time on the bottom 80% of tasks, the ones with no valuable impact. You will have seen many of the techniques in this book before, if you have read other time management books. But Tracy presents the material in a fresh way. Also, his writing style is simple and direct, which makes the book appealing. If you want to become more valuable to your organization, this book will give you practical techniques you can start using right away. To buy this book from Amazon, click here.